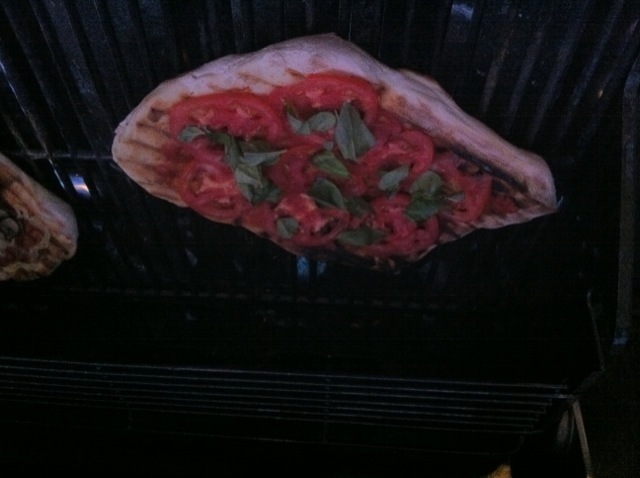 That’s right… I barbecue pizzas. What’s it to you? 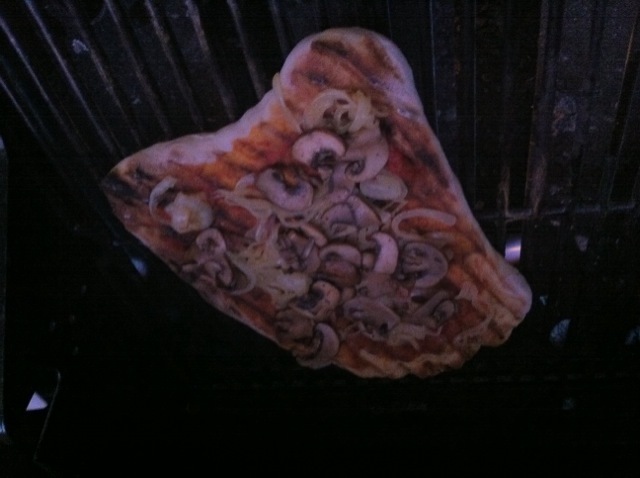 I make regular pizzas on my barbecue. The key is to pre-cook your veggies... 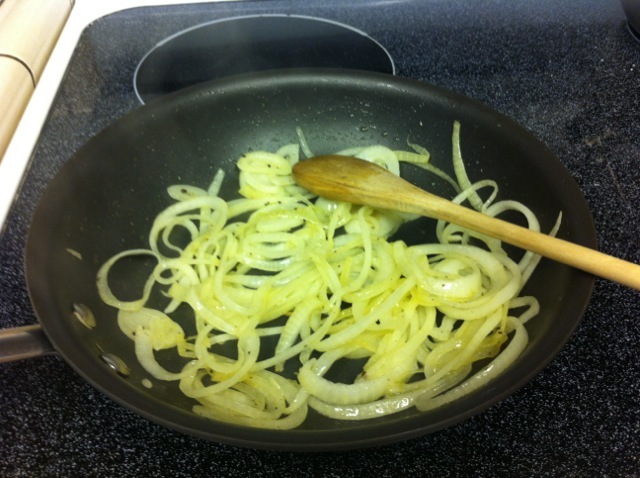 Here I caramelized some onion with olive oil and garlic. 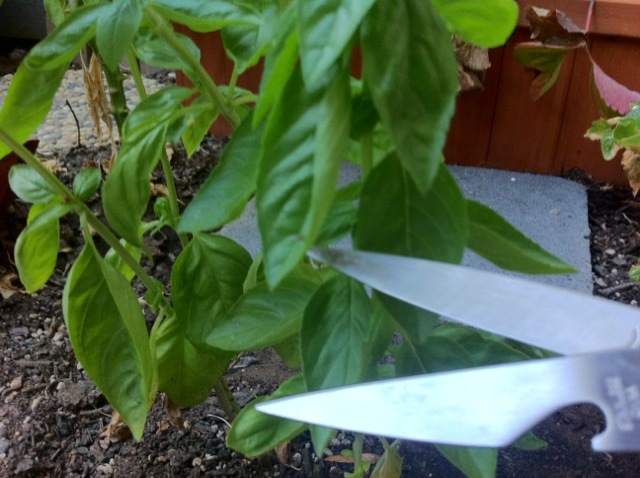 You know you've got to use simple fresh ingredients, so I snipped some basil from my garden. 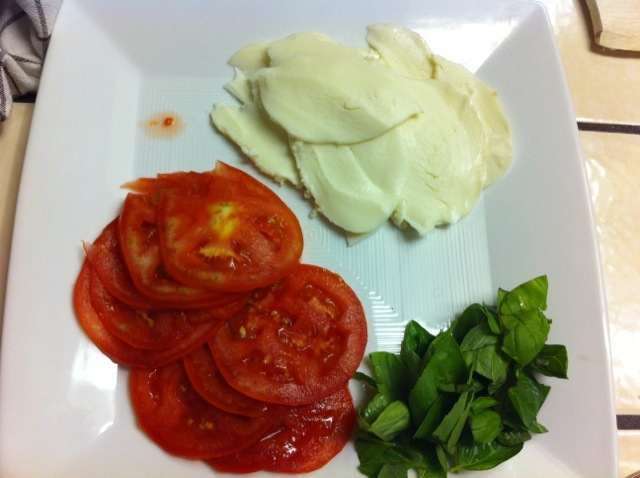 Tomatoes, fresh basil, and mozzarella for pizza number two. Now time to bring out the dough! 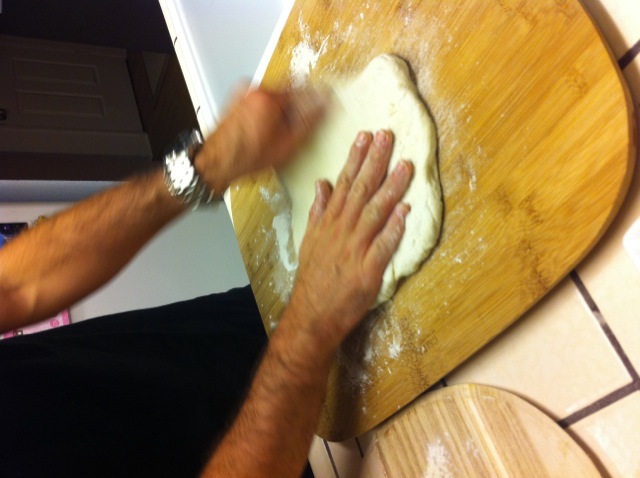 Using hella flour on a cutting board, I prefer to stretch my dough by hand instead of rolling it. That's right. My hand is blurry. Don't judge me! 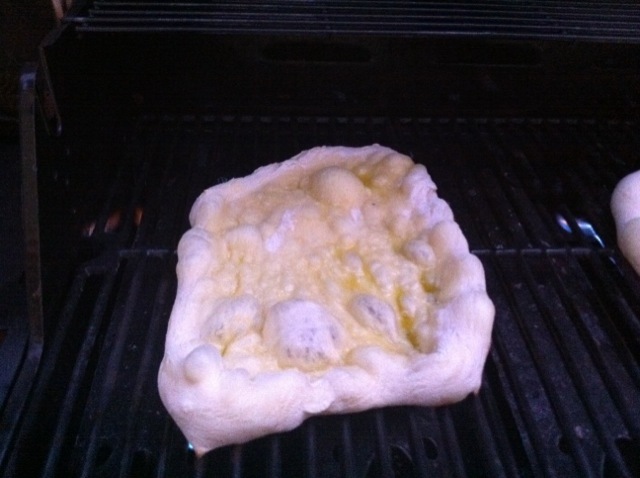 Brush the dough with olive oil, and place it on the grill (oil side down) for 3 - 5 minutes. Brush the exposed side of the dough with olive oil while you are waiting. 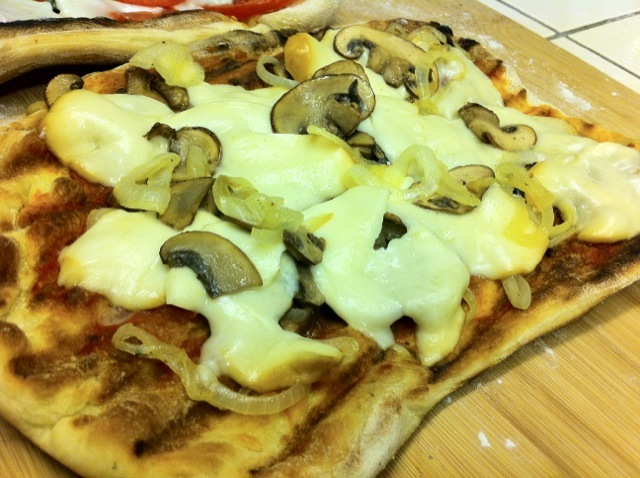 This mutant pizza was topped with caramelized onion and portabella mushrooms. Let the pizzas cook for another 5 – 7 minutes to get them all blistered and crunchy. Throw on your cheese and slam down the lid with anger for the last minute. 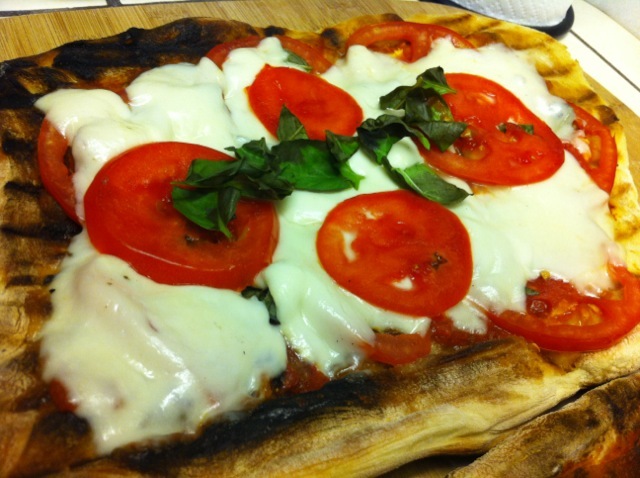 Tomato, fresh basil, and mozzarella... Bright and whimsical. 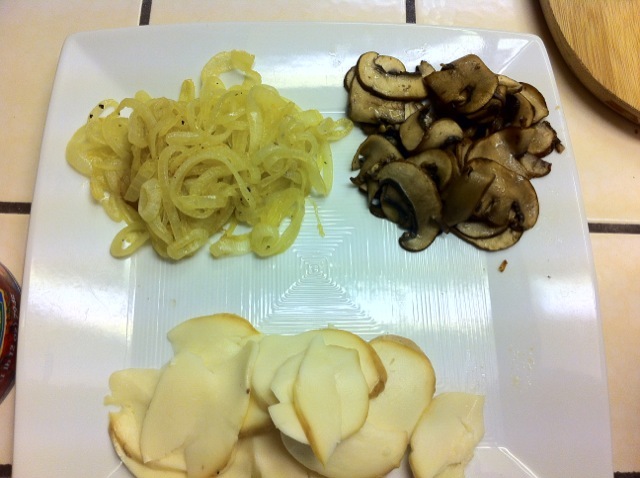 Caramelized onion, portabella mushrooms, and smoked mozzarella... Earthy and refined. Trader Joe's 2010 Grower's Reserve Zinfandel from Paso Robles... Again! 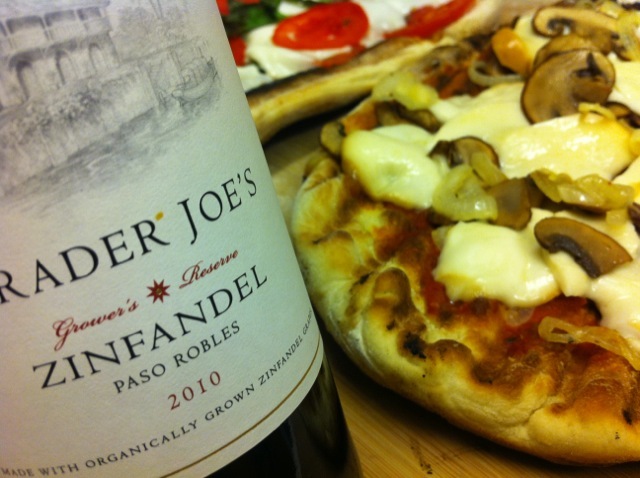 The first time I reviewed the Trader Joe’s 2010 Grower’s Reserve Zinfandel I was not stoked. This was a five dollar wine that I decanted for three hours… Just long enough for it to fall apart. I paired it with a pulled pork sandwich, and it just didn’t work. You can read the post yourself, or you can just trust me that I gave it an 84. This time I popped and poured the wine immediately. This time I paired it with two dope barbecued pizzas. Nose: Bright cherry and raspberry fruit. Taste: Nice dark plums with bright cranberry and raspberry. This medium weight wine gave a nice chalky (You know I’m ’bout it!) plum skin finnish, and paired nicely with both pizzas. Score: I was hella stoked on this wine… this time. It doesn’t have the backbone to age for a long time, but what it is bringing right now is dope. Buy this wine for a green back at TJ’s, and drink it NOW… unless you’re driving… Why you are driving while reading this blog, I’ll never know… Pull over! Give it an 89+ foo. Was it the difference in how long the wine was open? Was it the food pairing? Was it the food coma? Was it some combination of these factors? This entry was posted on September 24, 2011 at 12:22 pm and is filed under Uncategorized. You can follow any responses to this entry through the RSS 2.0 feed. You can leave a response, or trackback from your own site. I had two bottles of le crau vieux telegraphe 2005, opened both within 6 months of each other. The first bottle I opened was the best wine I have ever had. The second bottle I opened was okay. I don’t have a proper cellar so it might have gotten too hot over the summer, but i am not sure! I decanted both of them the same amount. I read online that it was going through a “dumb” period or something and that i was supposed to open it between 2012 and 2020.